For me, the year since my CNO Summit of November 2013 has been shaped by my experiences as a nurse, professional lead, patient and someone whose family members have needed care. More than 30 years since qualifying as a nurse, I have never stopped learning from my own and others’ experiences. The quality of the experience of care was brought home to me on a personal level this year with the death of Mo, my mother-in-law, who was the last close link to my late husband. I will always be grateful to the care team who respected and supported her wishes to stay at home for as long as possible and, when needed, provided compassionate care in hospital prior to her death. They also supported and cared for me. Every week I have the privilege of meeting nurses, midwives, students and other health care workers. I also meet Care Makers, a growing movement of people from all levels and disciplines seeking to example the 6Cs as a real and natural part of our working and life experience. These meetings are a direct opportunity to learn from others’ experiences and celebrate the commitment and focus demonstrated by our professions every day in a wide range of environments, whilst also taking the pulse of anything causing concern. I know that many people are working under significant pressure but still committed to delivering compassionate care. In recent months, I have been personally humbled and moved by a number of experiences in particular. I attended a gathering of retired Caribbean nurses, many of whom worked in the NHS in its early days. Their dedication, commitment and care helped to shape the legacy which is our experience in 2014. However, the meeting also showed me how much further there is still to go in championing opportunities and equality for BME staff, particularly at a senior level. The year has also been shaped by nursing developments at a national level. One such development took place in the summer when we published ward level staffing data in one place for the first time. This openness and transparency benefits us all and is the beginning of a process which will develop further with different metrics taking a holistic approach to staffing. We are now at the two-year point since the Compassion in Practice strategy was launched. The development of the strategy was fuelled by listening to staff and patients’ experiences, and I am encouraged that take-up continues, including Trusts who are reviewing their whole approach and function in line with the strategy. One of the ways in which experiences and successes are shared is through ‘6Cs in Action: Celebrating Excellence’ (previously ‘Story of the Month’) which is housed on 6Cs Live! and demonstrates how different experiences can become examples to learn from. At the CNO Summit, we will have the first “Compassion in Practice Awards” which will be a celebration of the great work being done across England. What makes an experience what it is, and more than a mere happening, is the ability and willingness to step back, reflect, look at it from different angles and let it develop you by making it part of you. This year has undoubtedly brought its tests, but we are stronger by sharing and joining our experiences together. 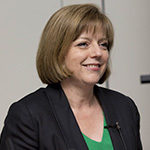 Jane Cummings, NHS England’s Chief Nursing Officer.